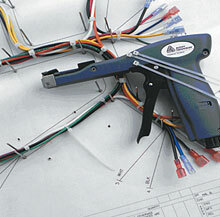 Cable ties are widely used in wire harness bundling, but are also used to secure, mount, tag and pair items. In addition to the standard locking cable tie, miniature, slim line, heavy duty, ladder, beaded (releasable), security, double headed and mounting cable ties are available. Most cable ties are made of Nylon which is noted for its toughness, impact strength, resistance to abrasion and chemicals. The standard color is natural and has an operating temperature of –40°C to 85°C. 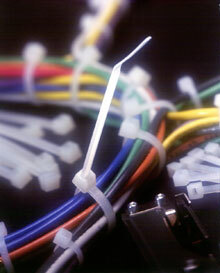 Weather resistant, heat stabilized and polypropylene cable ties are available. Weather resistant ties have a UV additive for greater resistance to the effects of Ultraviolet light. Heat stabilized ties are used in higher temperature applications (105°C) and polypropylene are used when lower tensile strength is a requirement.